Mallet finger is an injury to the tendon that straightens the last (distal) joint of the finger or thumb. In an extensor tendon injury affecting that joint, the tendon is either torn from its attachment to the last bone or avulsed with a bone fragment from its attachment site. Either way, the anchor is no longer connected to the bone that it needs to move. The result is a finger that lacks strength to fully extend, and stays flexed at rest. 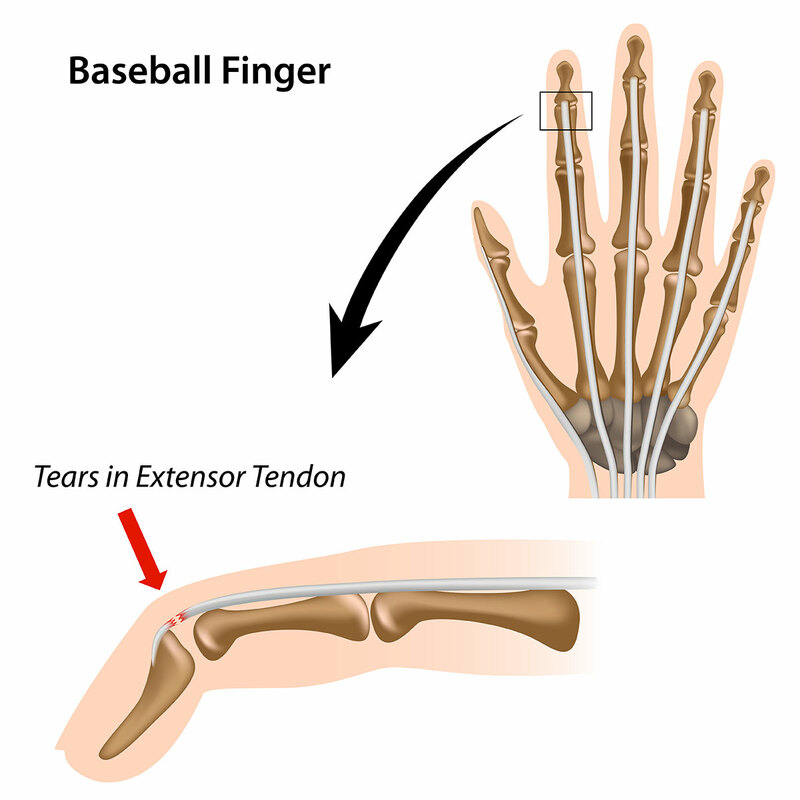 Mallet finger usually occurs from a forced flexion injury to that joint, either with a ball hitting that distal bone (basketball, football, baseball, etc) or with direct trauma, such as a baseball player diving into the bag. What should I do for a mallet finger? Treatment is rarely operative, with a large majority of mallet fingers treated non-operatively. The non-operative treatment involves protection and immobilization of that joint in a full-extension splint for 6-8 weeks. That allows the tendon to heal and preserve the function and cosmetic aspect of that distal joint. If there is a large avulsion fracture fragment, or significant subluxation and instability to the distal joint, then operative intervention is warranted. Evaluation in the clinic involves examining the affected joint that clinically can make the diagnosis of a mallet finger, and imaging to evaluate for an avulsion fracture. If you are concerned you may have sustained a mallet finger injury, come see us at Advanced Orthopaedic Specialists, and we will get you back on the road to recovery.